(First published by Bulatlat.com) — The Department of Labor and Employment (DOLE) has recently released a list of 20 firms that it said are engaged or suspected to be engaged in labor-only contracting. Some of the country’s largest companies topped the list, including Jollibee (14,960 workers); Dole Philippines (10,521); and PLDT (8,310). Conspicuously absent in the list are known supporters of the Duterte administration. One is SM, which is known for its chain of malls that hires thousands of contractual workers. According to Labor Secretary Silvestre Bello III, SM was not included in the list because it promised to regularize a total of 10,000 workers. He said that they are “satisfied” already with the retail giant’s commitment. But still, such promise does not justify the absence in the DOLE list of perhaps the most notorious and known biggest employer of contractual workers in the Philippines. By its own account, the SM Group has more than 94,500 employees which include various companies under the conglomerate engaged in banking, financing, property, retail, malls, hotel, resorts and entertainment. According to one estimate, nine out of 10 SM employees are contractual workers. Another is San Miguel Corporation (SMC). The diversified conglomerate (with operations in food and beverages, packaging, fuel and oil, power, and infrastructure) is said to employ around 20,000 workers, of whom only about 1,000 are regular workers. What could possibly explain the exclusion of these giant conglomerates – two of the biggest not only in the Philippines but also in the Asian region? The obvious answer is their close ties with President Duterte. Among the country’s major business groups, SM has been one of the most supportive to the current regime. Its top officials are among the select tycoons that share an intimate dinner or travel abroad with the President to look for business opportunities, and invited to government events to show support to centerpiece Duterte programs like the “Build, Build, Build”. Along with state-run banks, SM Group’s BDO Unibank is financing Duterte’s contentious modernization program for jeepneys. Its officials have publicly defended the controversial war on drugs and also offered the free showing of government’s anti-drug ads in SM cinemas nationwide. They supported the administration’s warming up of ties with China even as the latter has occupied and militarized Philippine-claimed territories in the South China Sea. SM was founded by the country’s only trillionaire Henry Sy Sr. who has been the richest Filipino for over a decade now. Sy’s already massive wealth has been rising astronomically under Duterte – from just below US$14 billion in 2016 to US$18 billion in 2017 and further to US$20 billion in 2018. That’s almost a 54 percent increase in just three years. SM aims to cash in on closer Philippine-China ties under Duterte. China is the world’s largest consumer market and the second biggest economy that could soon topple the US as number one. For Filipino oligarchs, the potential for profits is vast. On top of the already seven malls it has in China, SM is building a “supermall” in the major port city of Tianjin (said to rival the size of the US’s Pentagon building) as well as residential projects in various key Chinese cities. With closer bilateral ties, Chinese tourists are also flocking the country, benefitting SM’s interests in resorts and entertainment. An even more vocal apologist of the Duterte administration is SMC, especially its head honcho Ramon S. Ang. The SMC president was among Duterte’s campaign contributors in 2016 giving an undisclosed amount and perhaps other forms of support as Ang wasn’t even listed in the official Statement of Contributions and Expenditures (SOCE). Ang also offered to buy Duterte a private jet (worth as much as US$65 million) that he could use as President while donating Php1 billion to the Chief Executive’s pet campaign, the war on drugs. Like Sy, Ang’s fortune has also vastly grown in the past three years. From a reported net worth of US$1.21 billion in 2016, his wealth has more than doubled to US$2.5 billion in 2018. Duterte’s infrastructure push apparently also pushed up Ang’s riches, which also include interests in construction. Like SM, SMC has been capitalizing on Duterte’s programs. SMC is among those most aggressive in expanding in Mindanao particularly in establishing vast plantations and constructing infrastructure. In partnership with Malaysia’s Kuok Group, the conglomerate is developing about 18,495 hectares of forestlands covering four Davao del Norte municipalities for oil palm production. Just last August 2016, SMC also opened a 2,000-hectare industrial estate in Malita, Davao Occidental that also has a 20-meter deep seaport that can accommodate container vessels. SM and especially SMC are among the leading proponents in Duterte’s “Build, Build, Build” infrastructure development program, including through the controversial unsolicited route. SMC alone accounts for 53 percent (P1.59 trillion) of the cost of all unsolicited proposals (P3 trillion) that have pitched to the Duterte administration. These include the P700-billion New Manila International Airport; the P338.8-billion Manila Bay Integrated Flood Control, Coastal Defense and Expressway Project; and P554-billion expansion of the Metro Manila Skyway and the South Luzon Expressway (SLEX). SM (together with the Ayala group), on the other hand, has submitted an unsolicited proposal to build a P25-billion 8.6-kilometer elevated toll road that will supposedly help decongest traffic along EDSA. But as SM itself admitted, the main objective of the toll road is to increase access to its Mall of Asia complex. Through its BDO Unibank, SM also aims to profit from the “Build, Build, Build” by lending to project proponents or operators. One of the major campaign promises that Duterte made was ending “endo” (end of contract scheme or contractualization). But two years into his presidency, that promise has remained largely unfulfilled. With the biggest employers of contractual workers like SM and SMC as Duterte’s biggest backers, that should not come as a surprise. Under fire for its Php10,000-gaffe, the National Economic and Development Authority (NEDA) is now saying, through Secretary Ernesto Pernia, that the cost of decent living for an ordinary family is Php42,000. This admission by the country’s chief economist on the amount required by a Filipino household to afford a decent living has underlined the need and urgency of a substantial wage hike, including the proposed Php750-national minimum wage, which ironically Pernia and other economic managers of the Duterte administration are opposing. Using data from the National Wages and Productivity Commission (NWPC), it appears that current wages in the country could only meet as low as 13% to just 27% of NEDA’s estimated cost of decent living. In the National Capital Region (NCR), for instance, the daily minimum wage is just Php475 (for retail/service establishments with 15 or less workers) to Php512 (all other non-agriculture industries). 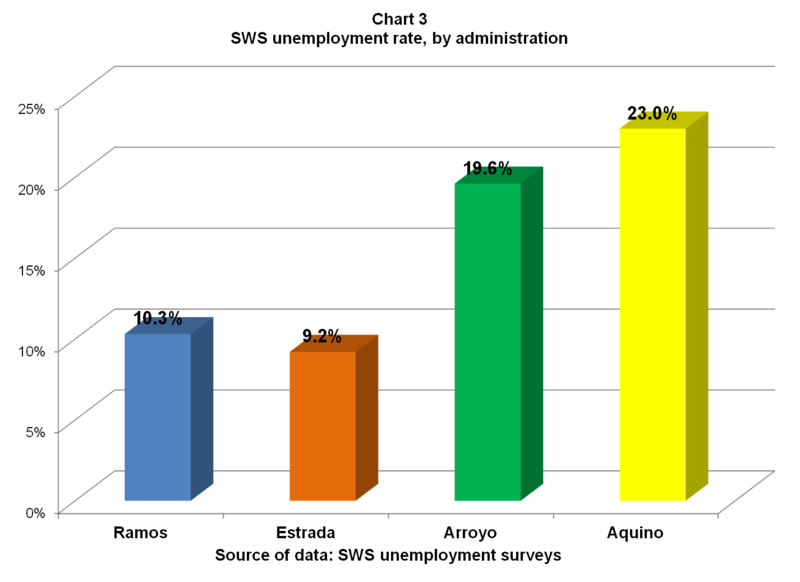 These translate to a monthly income of about Php10,331.25 to Php11,136.00. This means that the minimum wage in NCR is equivalent to only 25% to 27% of NEDA’s estimated cost of decent living. Put another way, an ordinary household in NCR needs four minimum wage earners to afford a decent living. The situation is much worse in regions outside NCR where the minimum wage is way lower. In the Autonomous Region in Muslim Mindanao (ARMM), for example, the minimum wage is a paltry Php270 (agriculture) to Php280 (non-agriculture) per day. Per month, the minimum wage in the region is about Php5,872.50 to Php6,090.00, which meets a meager 14% to 15% of the cost of decent living. And worse, amid ever increasing prices and rising inflation and additional tax burden such as those under the TRAIN (Tax Reform for Acceleration and Inclusion) Law, the already meager wages of Filipino workers are further being eroded. Meanwhile, the proposed Php750-national minimum wage is even less than 40% of NEDA’s cost of decent living. The workers are asking much less of what their families need to live decently and they are still being deprived. Daang Matuwid has consistently opposed proposals for a substantial wage hike. Since 2010, the daily minimum wage in the Philippines has only increased by Php13 (Ilocos Region or Region I) to Php77 (National Capital Region or NCR). These adjustments are insignificant amid the soaring cost of living. For instance, in NCR where the minimum wage is the highest and which also posted the largest wage hike among all regions, the estimated cost of living jumped by more than Php114 during the same period, easily offsetting the Php77-adjustment in the minimum wage. Consequently, the already big gap between the daily minimum wage and the daily cost of living has even furthered widened under Daang Matuwid – from Php571 in 2010 to about Php608 today. This means that the capacity of workers and their families to meet basic food and non-food needs has been further eroded. Worse, instead of a substantial wage increase, Daang Matuwid introduced the so-called two-tiered wage system that provided capitalists another tool in pressing down the pay of their workers. Under the two-tiered wage system, companies will give workers a basic floor wage, which is computed above the official poverty threshold but below the existing average pay. Employers can then voluntarily increase the basic floor wage depending on their own computation of the workers’ productivity. Such system means greater abandonment of government of its obligation to set wages that would allow workers and their families to achieve decent living while giving profit-seeking firms more freedom to exploit the workers. Daang Matuwid oppressed Filipino workers with onerous taxes. Compared to other countries in Southeast Asia, the Philippines has the highest rates for income tax (5-32%) and for the value-added tax or VAT (12%). The tax system is so oppressive that that those earning about Php50,000 a month pay the same tax rate of 32% as the billionaires who own and run the country’s biggest conglomerates. Meanwhile, the regressive 12% VAT punishes the ordinary income earners as even the most basic goods and services are covered including water, electricity and petroleum products, which all directly impact on the standard of living and inflate the cost of other commodities. There have been several proposals in Congress to correct this injustice but were rejected by the Daang Matuwid regime, dismissing them as populist and impractical measures. “Kung papogihan lang ito, wag na tayong mag-income tax,” Mar Roxas was quoted as saying. But the issue, of course, is much deeper than “papogihan” as a progressive tax reform system will allow a just distribution of wealth, help improve the living condition of many, and spur economic growth driven by domestic spending. Another additional tax burden imposed on Filipino workers by Daang Matuwid is the so-called sin tax on alcohol and tobacco products. Guised as a measure to supposedly address health concerns caused by smoking and drinking (even as the national health budget remains grossly inadequate, state hospitals are being privatized, and poverty-related illnesses remain widespread amid low wages/incomes and lack of jobs), the sin tax in reality is primarily aimed at raising government revenues at the expense of ordinary income earners. Just early this year, President Aquino vetoed the bill hiking the monthly pension (which has been at a paltry Php1,200 for almost two decades now) of 2.1 million members of the Social Security System (SSS). The Daang Matuwid regime justified its heartless decision by claiming that the SSS might go bankrupt if the proposed Php2,000-pension hike is implemented. But as proponents of the pension hike led by Bayan Muna Rep. and Makabayan senatorial bet Neri Colmenares pointed out, SSS can avoid bankruptcy if it will improve its collection efficiency that currently stands at a dismal 35-38% (including an uncollected amount of Php13 billion as of 2014) and cut back questionable expenses such as massive bonuses for its board members (e.g. Php200 million in retirement package). The administrative cost of SSS at almost 7% of contributions is too high compared to other countries (e.g. Singapore’s 0.5% or Malaysia’s 2%). By stoking bankruptcy fears, the Daang Matuwid regime is also oblivious to its legally mandated obligation to replenish the SSS should it incur a deficit arising from the pension hike. For the elderly workers, the Php2,000-pension hike means duly recognizing their contribution not only to the SSS fund but to the national economy while promoting their capacity to support themselves in their retirement. The Daang Matuwid regime would want us to believe that the jobs situation has improved under its watch. But nothing could be farther from the truth. While 692,000 jobs a year appear to have been created between 2010 and 2015, almost 7 out of 10 of the additional jobs were made in hotels, restaurants, call centers, malls, and other less productive sectors as well as in highly seasonal, contractual work like construction. In addition, research group IBON Foundation noted that job creation under Daang Matuwid is much weaker compared to previous years. Between 2000 and 2009, for instance, 732,000 jobs were created annually. Chronic job scarcity is being concealed by distorted official employment data as government labor surveys tend to exclude jobless workers who have already been discouraged by lack of employment opportunities. Including such workers, IBON estimates that unemployment rate remains at double-digit with more than 4 million jobless workers today – or basically the same as the situation before Daang Matuwid took over. A separate survey by the Social Weather Stations (SWS), on the other hand, shows that the number of jobless actually increased from an average of 9.5 million in 2010 to 9.8 million in 2015. Also, four out of 10 workers are own-account and unpaid family workers that further illustrate the low quality of jobs in the country. Job insecurity, meanwhile, remains severe. IBON estimated that four out of 10 rank and file workers are in non-regular work – e.g., contractual, probationary, casual, seasonal, apprentice workers or agency-hired. Daang Matuwid’s centerpiece economic program – the public-private partnership (PPP) – is a continuation, expansion and deepening of the same neoliberal privatization policy started by the first Aquino administration in the 1980s. Under PPP, fares in the LRT 1 and 2 and MRT 3 have jumped by as much Php10 to 13. Among the most affected are the workers/employees and job seekers who comprise about 59% of LRT and MRT commuters. Another 32% are students mostly from working class families. 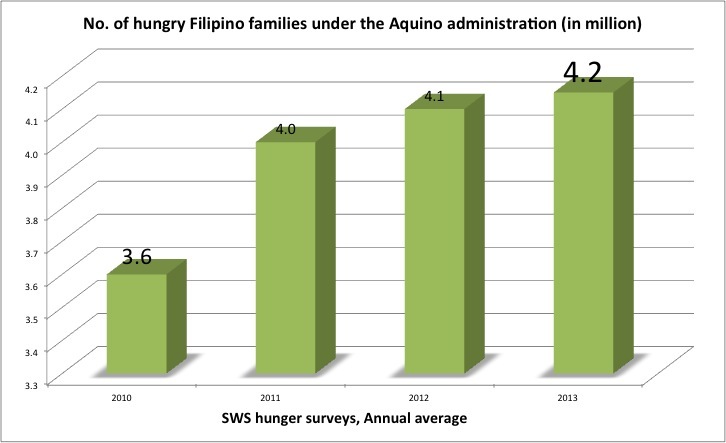 In its latest survey, the Social Weather Stations (SWS) said that the number of Filipino households that consider themselves poor has slightly declined to 53% in the first quarter of 2014 from 55% in the last quarter of 2013. 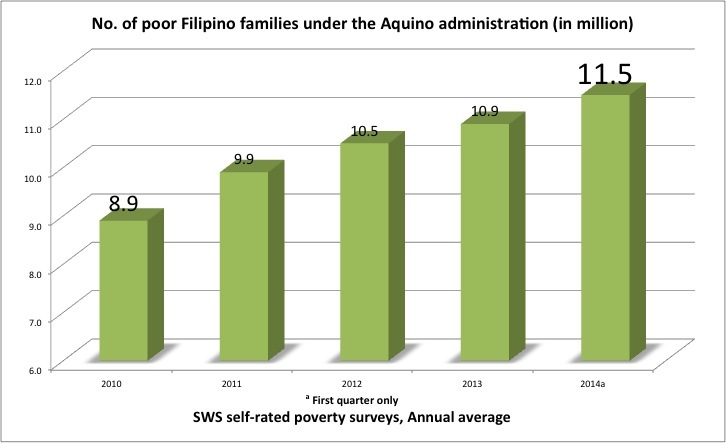 The Aquino administration was quick to point out that the SWS findings mirror the official poverty data released by the Philippine Statistics Authority (PSA). Two days before Labor Day, the PSA released the Annual Poverty Indicator Survey (APIS) which reported that the number of Filipinos considered poor based on their average income fell to 24.9% in first semester of 2013 from 27.9% in the same period in 2012. The presentation of these two surveys, released one week apart, depicts a picture of an improving poverty situation. The National Economic and Development Authority (NEDA) described the findings as a “remarkable improvement” in poverty and credited the “strong economic growth” and “government investments in social development programs”. But their manner of presentation is misleading. First, a two or three point decline in poverty is hardly a remarkable improvement especially when one considers government’s claim of rapid economic growth and massive expansion in conditional cash transfer (CCT) funds. Second, comparing poverty figures on a quarterly or semestral basis tends to hide long-term trends, which provides a more useful and accurate appreciation of poverty’s general direction. But who needs an expert when common sense tells us that P52 could not afford decent living? 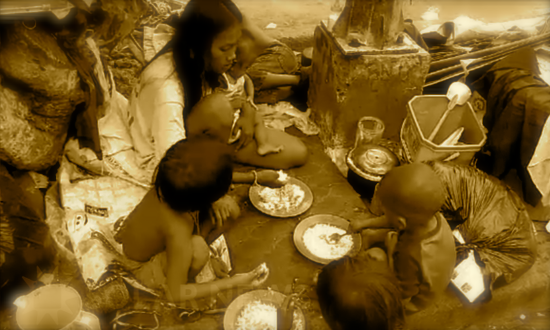 Using P100 to P125 per person a day as standard, IBON Foundation estimated that the number of poor Filipinos could reach 56 to 66 million, or about 60-70% of the population. On June 30, President Benigno Aquino III will mark his second year in office. Then on July 23, he will deliver his third State of the Nation Address (Sona). How do we assess his performance so far? One approach is to gauge Aquino’s achievements vis-à-vis the promises he made to the people in 2010. This series of articles reviews the performance of the President in terms of his campaign promises on improving the economy and the living condition of the people. As reference, we will use the document “A Social Contract with the Filipino People”. In this document, then presidential bet Aquino outlined his platform of government. We will also refer to the Philippine Development Plan (PDP) 2011-2016, which details how Aquino plans to implement his so-called Social Contract. These Social Contract commitments can be categorized into five: (1) Job creation; (2) Provision of social services; (3) Poverty reduction; (4) Agricultural development; and (5) Promotion of private business. Aquino criticized the Arroyo administration for conjuring false growth statistics. In his PDP, Aquino said that his government will aim for inclusive growth. This means economic expansion which translates to more jobs. The PDP has specifically set a target of one million new jobs every year, based on an annual growth of 7-8% in the gross domestic product (GDP). Using official data from the National Statistics Office (NSO), the average number of jobs in 2010 was about 36 million. It increased to 37.2 million in 2011 and to 37.6 million this year. Aquino, thus, has “created” around 1.6 million new jobs or 800,000 a year. This seems impressive considering that the GDP grew by an average of just 4.5% a year during the period. But the additional jobs are negated by the increase in the size of the labor force. From 2010 to 2012, the labor force grew by 1.6 million, the same volume as the increase in the number of jobs. Hence, official unemployment did not improve during the period, remaining at more than 7 percent. Further, the quality of additional jobs remained dismal. Of the 1.6 million new jobs, more than 800,000 were produced by the services sector, characterized by highly irregular, less productive employment. They include jobs covered by “endo” (end of contract) and “5-5-5” schemes, where workers are hired under rotating 5-month contracts. Aquino has rejected proposals to fully ban contractualization, along with the ₱125 wage hike bill, claiming they will create “more problems”. Of course, it could be argued that low quality jobs are better than no jobs at all. But what Aquino promised are new jobs that empower the people and give them the chance to get out of poverty. To be sure, part-time, insecure or unpaid jobs do not allow workers to be productive enough and improve their miserable condition. Worse, jobs being created are not only low quality but also insufficient in relation to the burgeoning labor force. It does not help that NSO data on employment tend to understate domestic job scarcity. Official methodology counts as employed those who “worked” for even just one hour in a week, which artificially bloats the number of employed. On the other hand, it excludes as unemployed the job seekers who are unavailable for work despite an opportunity due to illness, family obligations, etc. This falsely deflates the number of jobless. Aquino is aware of this anomaly. In one of his press briefings prior to official proclamation, he said one of the first things he will do is to clarify how government counts the jobless. 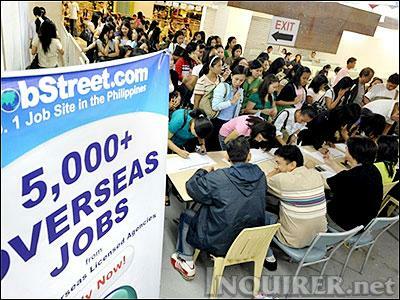 This, according to Aquino, will let government design a more reliable employment program. Alas, Aquino chose to continue the unreliable NSO methodology began by the Arroyo administration in 2005 in an obvious attempt to hide the worsening jobs crisis. Fortunately, independent surveys, such as the one regularly conducted by the Social Weather Stations (SWS), provide us a more dependable picture of the domestic labor market. 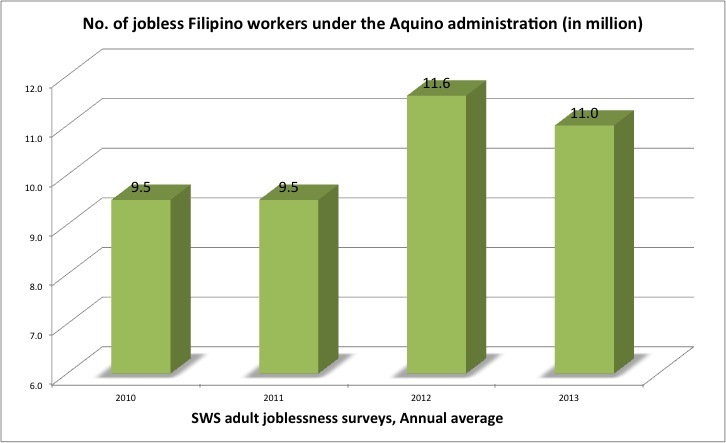 In its latest (March 2012) survey on adult unemployment, the SWS reported that 34.4%, or about 13.8 million workers, are jobless. Using SWS surveys, it appears that the incidence of unemployment is worst under Aquino, averaging 26.8% in his first two years. During the term of Gloria Arroyo, it averaged 19.6%; Joseph Estrada, 9.2% and; Fidel Ramos, 10.3 percent. Unemployment is on its way to triple its level from just two decades ago. The current jobs crisis is the result of the accumulated impact of decades of defective and destructive economic programs implemented by previous regimes such as trade and investment liberalization, neoliberal restructuring of agriculture, etc. 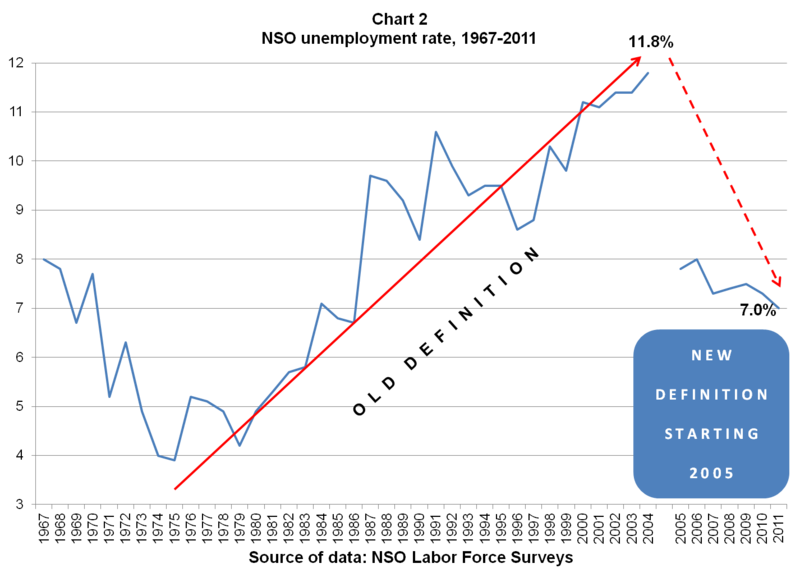 Aquino is not expected to fully reverse this long-term trend of deteriorating job scarcity in two years. But instead of laying down the groundwork to address the jobs crisis such as reviewing and scrapping laws that liberalized key sectors of the economy, it’s business as usual under the Aquino administration. Export-oriented, foreign capital-dependent industries that are vulnerable to global boom and bust continue to be promoted under the PDP 2011-2016. Local micro, small and medium enterprises (MSMEs), which account for around 61% of employment, remain marginalized as policies continue to favor big and foreign corporations. There is no plan to reverse trade and investment liberalization that destroyed local industries and jobs, especially MSMEs. There is no industrialization plan anchored on vibrant domestic production and consumption. MSME development is still geared towards linking them to the highly volatile foreign markets and as subcontractors of mostly foreign firms. Thus, the potential of MSMEs to massively and sustainably contribute to domestic job creation remains greatly hampered. Indeed, this administration does not have a comprehensive and sustainable job creation plan to speak of. Contrary to the Social Contract’s pronouncement that it will create jobs at home and will not treat our workers as export commodities, Aquino has turned out to be the largest exporter of Filipino workers among all Presidents. In the past two years, Aquino has aggressively pursued new bilateral deals with various countries to create additional market for Philippine labor export. It has recently lifted the deployment ban in politically turbulent countries like Libya, Sudan and Nigeria as well as in Iraq and Afghanistan. 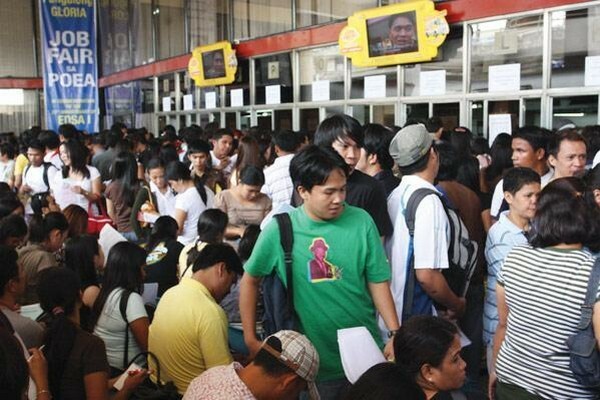 Data from the Philippine Overseas Employment Administration (POEA) show that the deployment of overseas Filipino workers (OFWs) under Aquino has already reached around 1.4 million a year. During Arroyo’s time, annual deployment was pegged at 1 million; Estrada, 0.84 million; Ramos, 0.69 million; and Cory Aquino, 0.47 million. OFW deployment has already almost tripled since the administration of Aquino’s mother. Worse, Aquino has been remiss even in his commitment to ensure the welfare and protection of OFWs. Migrante International noted in a report that the 2012 budget for OFW welfare and services has been cut by ₱792 million. Per OFW, the Aquino administration is allocating a measly ₱262 for welfare and services. Meanwhile, it is collecting a huge ₱20,000 from each OFW for various fees and taxes. Aquino’s neglect of migrant workers is further illustrated in the inept evacuation of OFWs from MENA (Middle East and North Africa) countries undergoing political turmoil, not to mention the four Filipinos executed abroad in the past two years.